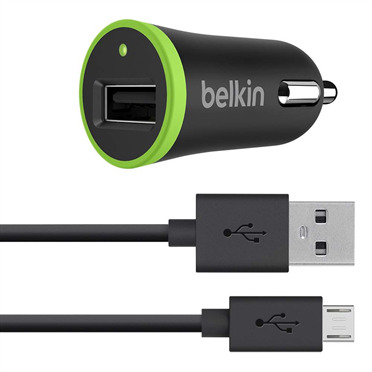 The Belkin Universal Car Charger comes with a 4' feet Micro-USB to USB cable, so you can charge your smartphone at the fastest possible speed. And because it's removable, the cable can be used anywhere--plug it into your laptop to charge and sync, or use your own car charger to charge on the go. Great as a replacement cable or if you simply need an extra. Compatible with most smartphones with a Micro-USB port. The USB 2.0 Port is universal, so you can plug in any USB charging cable to charge a variety of different mobile devices at the fastest possible speed, including any brand smartphone or any other mobile device. To begin charging, simply plug in the USB cable that came with your device(cable not included). The Belkin Universal Car Charger is extremely fast, but it's also extremely small. Plug it into your dash and it seamlessly blends in with your car's interior. And at just .56 ounces, it weighs less than a few quarters in your pocket. 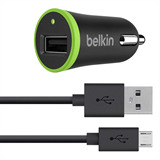 Use the versatile Belkin Universal Car Charger with your own Lightning to USB Cable to charge and sync your phone. Or plug in your 30-pin cable to charge other Apple devices. It's the best charger for your Galaxy S4, iPhone 5, and all of your mobile devices for when you or your passengers have different devices to charge.